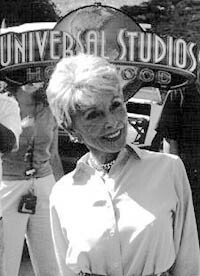 As part of Universal Studio's tribute to Hitchcock, Janet Leigh returned to that notorious Room 1 of the Bates Motel set (located in the backlot of Universal Studios and accessible via the park's tour tram). For the occasion, AMC scream contest winner, Sue Pelinski of Park Ridge, IL, was given the high honor of recreating that famous bathroom drama. Pelinski who shared a shrill with Leigh today said, "She's so pretty and so nice. She said she wouldn't scream without me. .... It's been a scream!" Press: Is this the first time you've been back to the Bate's Motel? JL: Well no. I visited Tony Perkins when he was here to do Psycho 2 and 3. And I've been back myself with my grandchildren, you know, to see the park. Oh and for Amazon.com's tribute to Hitchcock. Press: What did you think of the remake? JL: I didn't see it. Press: After doing that shower scene, do you get chills each time you step in to take one these days? JL: I don't take showers as a result, not the acting it, but the seeing it - edited, scored and put together. It left such an impression. Press: Were you upset about Alfred turning the cold water on you? JL: That's a rumor. The cold water was not turned on. I can scream very nicely on my own. That's what I'm paid to do. The water was extremely comfortable. Press: What about the statements that Alfred made demeaning actors. JL: Hitchcock said that stuff about actors to get a rise. He had a lot of respect for actors. Through September 24, 2000 each Sunday night at 8:00e.s.t., AMC will air a Hitchcock film introduced by Sharon Stone.